Black people in America are under siege by a racist white supremacist policing system that is designed to target them. 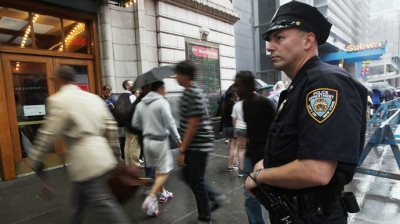 AFRICANGLOBE – Recording of a conversation between an NYPD cop and his supervisor, which appears to evidence his being pressured into profiling Black men — illegal, ‘unofficial’ quotas — has just been released by Gawker. While the New York Daily News originally broke the story in January, audio hasn’t been released by any source until Gawker published it on Wednesday. New York City Transit Officer Michael Birch alleges in a federal class-action lawsuit — for which officers involved are known collectively as the “NYPD 12” — that his supervisors retaliated against him when he failed to meet illegal quotas for stopping Black men. Though Gawker only released a two-minute clip from the 36-minute total audio recording, its content appears to damningly reinforce Birch’s allegations of what transpired in a conversation with then-Captain Constantin Tsachas, during a performance evaluation in August 2012. COMMANDING OFFICER [CO]: Who commits the crimes in this city? BIRCH: Who commits the crimes? Well, it’s mostly teenagers, anywhere between the ages of 15 and 19, mostly male Blacks and Hispanics. CO: OK. Who are you stopping? BIRCH: Everybody. I stop everybody. CO: Fifty-four TABs up 8/20. Twenty-five of those are female. Half. BIRCH: Like I said, I stop everybody. I’m not targeting anybody. CO: You just told me who the bad guys are. BIRCH: Yeah, I know that. But there’s also other people who are committing violations as well. I’m not saying that there’s not violations being made. BIRCH: Plenty of people that I write summonses to are male Blacks and male Hispanics. CO: You stopped two male Blacks. BIRCH: Not for the whole year. You’re telling me for the whole year I only stopped two male Blacks for summonses? CO: 8/20. From January 1st to August 20th. Fifty-four TABs: two male Blacks, seven Hispanics, seven other, ten white, three Asian. So where are you targeting the perps that you just told me? BIRCH: Like I said, if I don’t see a perp jumping over the turnstile, what am I supposed to do to him? CO: These people are not going to pop. CO: Did you think that she was going to pop? BIRCH: Did I think she was going to pop? I didn’t put no thought into it. If you come up for a collar, I’m taking you in. CO: Here’s what I see. You just described to me who’s committing the crimes. You’re fully aware of it. But you’re not targeting those people. BIRCH: I am. I’m targeting everybody. CO: So you only saw two male Blacks jump the turnstile? BIRCH: If you’re saying that’s what’s in front of you, then yes, that’s all I saw, is two male Blacks for the whole year jumping the turnstile. If you’re saying that’s what’s in front of you, I’m not disputing that. If that’s what I got there. CO: That is what you have. That is not disputed here. BIRCH: I’m saying, we’re also talking Hispanics here as well. I stopped a lot of Hispanics, too. CO: Seven male Hispanics. But more than half are female. BIRCH: And like I said, everybody’s committing violations in front of me. Birch claims in the suit he was allotted less desirable assignments on the job, was denied overtime, and became the subject of monitoring as a result of not filling these illegal quotas. Though Birch originally sued on his own over the alleged quotas he was unofficially required to fulfill, the officer has since had to appeal after a judge threw out the claim. “The powers that be are more concerned about their personal legacies than the civil rights of the citizens,” Birch’s attorney, Eric Sanders, told reporters.